I have a special kind of affection of working with citrus fruits in desserts. Normally I dislike when I smell of food after I’ve cooked, but I looove having the scent of citrus fruits on my hands. I try not to wash them for as long as I can, but that doesn’t last very long with me. So with the smell of sweet oranges lingering through the kitchen, I baked these cookies. I thought they were a bit too sweet; it might have been the amount of sugar or the white chocolate chips. Rating: 3 out of 5. - In a large bowl, sift together the flour, the baking soda, and salt. Set aside. - In a large bowl, cream the butter with sugars until smooth, about 3 minutes. Add the egg and mix well. Add the flour mixture and beat thoroughly. Stir in the orange zest and the vanilla chips. Drop by rounded teaspoonfuls onto ungreased cookie sheets, leaving several inches between for expansion. Bake for 10 – 12 minutes or until lightly golden brown. Cointreau (orange-flavored liqueur) is one of my favorite alcoholic drinks. I thought it would be a nice addition in these cookies. Great idea to use Orange liquor. I always have Contreau on hand for a Mousse. I am sure we would like these cookies a lot. Thanks. Mmmm, these looks so good. I have some Grand Marnier....I might have to try your recipe using it instead and see what happens. Such a great idea...I am sure it adds tremendous flavor. Thanks! I have definitely noticed your affection of citrus. My favourite is probably lemon or orange. And cointreau is perfect in baked goods. I think the white chocolate and cointreau would be a dream. If I were to make them, should I reduce the sugar by half? 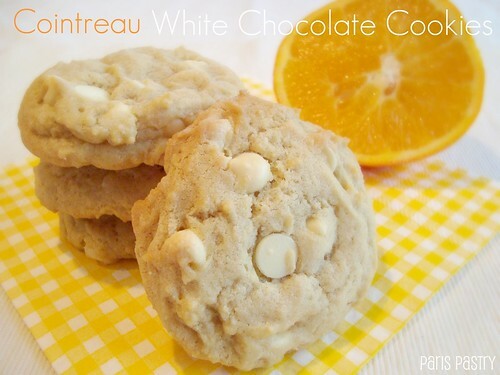 @Brittany: I guess if I were making these again I would omit the white chocolate chips to make them less sweet. The chunkiness looks perfect! 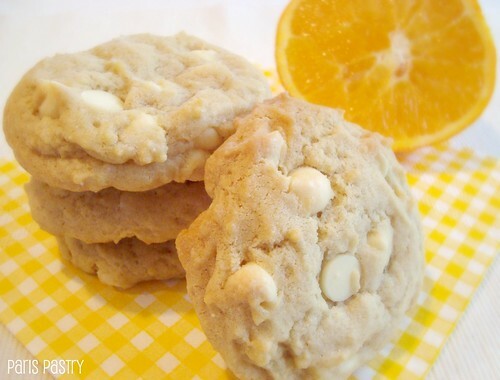 I looove white chocolate chips--the alliance with the citrus is definitely tempting! Just discovered your lovely blog. I want these cookies now. I love the smell of orange, too. But my friend and former coworker does even more! Funny enough, she doesn't like to eat oranges herself but would ask me to go to her office whenever I peeled mine so she could smell them. These cookies look great. Hopefully you could decrease the sugar a little next time and they'll be just perfect :).